The Clean Theme is designed to be easily customizable with CSS - as much or as little as you'd like. To get you started, we've organized this directory by each area of the standard TypePad templates, with code you can copy and paste right into the Custom CSS page. You can use the code as-is or make your own customizations from there. If you haven't already set up the Clean framework on your blog, head over here first. Log into your TypePad account and go to the Design tab for the blog you are working with. Under Create a New Design, click "Choose a theme..." to open the theme chooser. There, choose the Clean theme which is right at the top. On the next screen, check the box to apply the design to your blog and save your settings. This is where you put the Custom CSS codes found in this guide. When you paste in the Custom CSS and save, the styles are applied to your blog. The possibilities are endless with the different customizations you can do with just little CSS. When creating a new Theme, there are five Layout options you can style. Layouts are preset HTML and are output automatically by TypePad. The Theme is the customized CSS that sits on top of these Layouts. In short, Themes are easy because the HTML is already done. All you need to do is put the CSS on and it creates a whole new look. You can choose to create a Theme that applies to one of of the Layouts above, or some of them, or all. This is done in the same stylesheet. See Column Widths for more information about setting the style for the different layouts. Right on! Let's get to coding! So now you start. You can start with an existing theme and build on top of it, or you can start from scratch. Depending on how you work through CSS, either of these may work best for you. Create your blog and choose the Clean Theme in Design. Select the Layout options (2 Column Left, 2 Column Right, etc) that you desire to test different layouts. Build on top of Clean using the things from the Style Guide or other CSS code snippets you find on the internet. Add your CSS to the Custom CSS area to apply it to the blog. If you're comfortable with CSS, you may find it more interesting to build from the bottom up. Create your blog and choose the Styleless Theme in Design. This will give you the base Layouts with no previous CSS applied to the blog. The main font and background colors are set in this section. You can copy over this file and change the color codes to change these colors. This is where the banner area is set up. This section is the blog navigation strip that sits under the banner. Here the font size, style, and weight is set. This section builds on the frame-default file, defining the container width and the column widths (post area and sidebars) for the layouts. The default positioning (float, margin, padding) for the main page elements is set here. Usually you do not need to make major changes in this section. These are the post footer buttons. Generally the default buttons are used here, though you can edit them in this section if you wish. These are the margins and padding for the blog post items. These are the margins and padding for the sidebar items, and styling items for special sidebar modules. The margins and padding for the Archives listing, Category & Date Archive pages, and Search Results pages. This section styles the blog comments area. This is the default styling for TypePad Connect comments. This is the style for display on phones, iPad, etc. 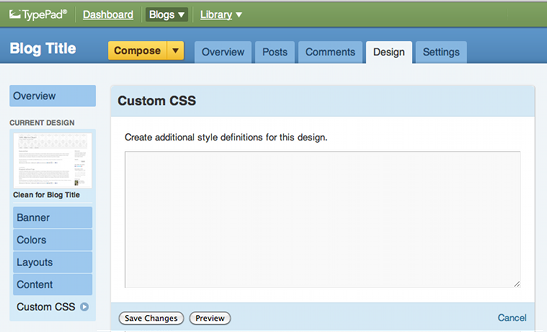 To apply the styles to your blog, paste the code into the Custom CSS area. Would you like to be featured on TypePad and share your design creativity with the community? Fill out this handy dandy form with the CSS you've cooked up and we'll be in touch!